Behind the scene’s while we’ve been deciding on a logo, we’ve also been writing content for the website, some of it you can already see, but some of it is still hidden as we finish it off. 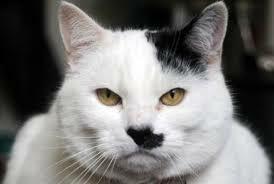 Now today I’m going to talk about the website and the content management system behind it, WordPress, this might get a little dull and techie, but to stop you getting bored, here’s a picture of a cat which looks like Hitler. And I thought 8-Bit Dug looked disapproving . . . Anyway, in the old days web sites were hand made, and some techie dude would sit down and hand code all of the pages, using the mark-up language HTML (Hyper Text Markup Language). A mark-up language differs from a programming language as all it deals with is the presentation of the data within the page. How images are formatted, which parts of the text are bold, which in italics, etc. This being Hyper Text Markup Language, it also dealt with Hyper Text, the links which make up the internet. So that you could highlight some text which would lead you to a totally different place on the internet, whether it was used to create a menu, or link you to some further information or a definition of the highlighted text. While HTML is a simple language, and coding in it is straight-forwards, it was/is time consuming, and creating and updating a web site would swallow hours. There were tools to make this easier, allowing the creation of the document to be simplified, letting anyone who could operate Microsoft Office capable of putting a web site together. Then along came CMS (Content Management Systems), these do all of the heavy lifting for the user. Building the links between the pages, storing the images, and allowing a friendly WYSIWYG (What You See Is What You Get) interface. And all of this is done directly on the server. Meaning now you can operate a website from any device. You can upload your photos straight from your phone to the web server, and then incorporate them directly into a web page, a webpage you entered into the CMS like a text message. Content Management Systems have truly revolutionised the way web sites are built and run. Another massive advantage of CMS’s, is that in these days where there are people aiming to hack into and deface or destroy web sites for no other reason than “they can”, data security is another full time job. Keeping up to date with how websites can be hacked, and simple errors exploited to gain control is vital, but far too time consuming for anyone but a professional. So being able to hand over control of that to a team of specialists, whose product’s reputation depends on their catching and fixing any bugs which might be used to break into a web site is a very comforting idea indeed. Now, there are many competing CMS’s out there, one of the most popular is Drupal, which for instance is used to run the web site of the White House. We however have chosen WordPress, and we have chosen it for no other reason than we tried it first and are now comfortable using it. There seem to be only slight advantages to using one of these packages over using the others, so as long as we keep track of what developments are being made, we’re as good sticking with what we know. WordPress is primarily a blogging engine, allowing daily updates to be presented to users from the sites front page, however this capability is expanded vastly by use of Plug-ins. These literally plug into the framework that WordPress provides, and add new functionality. Some functions are as minor as adding a message to the top of every page, others add e-commerce capabilities so you can run a shop, or one we use here, which posts updates such as this one to our social media profiles on Facebook and Twitter. And all of this functionality comes with amazing ease of use, letting you once you’ve done it a few times, to put a new website together in just a couple of hours, instead of taking that for each page, drag and drop functions allow you to build an attractive, functional and robust web site rapidly, and without typing a single line of code. So, if you’re interested in having your own website, I recommend trying WordPress, and if you want a little help, then feel free to get in touch and we’ll do our very best to lend a hand and give you the benefit of our experience. Previous PostPrevious Down to business. Next PostNext A host, a host, my kingdom for a host!